The " Cortina " screen by Sebastiano Bottos is a geometric piece of furniture handcrafted by assembling extroflexed pine wood elements, the result of an innovating working process that allows contortion of wooden panels obtaining a distinctive three - dimensional effect. Perfect as the centrepiece, jet even in a background corner able to remain the theatrical protagonist of the room. Completely designed and made in Italy. Also available in others wood species. 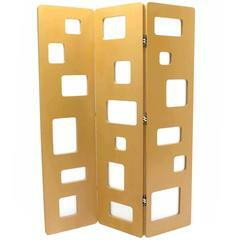 Measures variations, different wood species and finishes available under request. 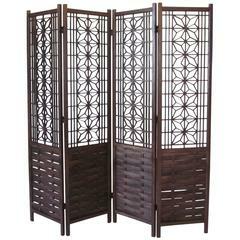 Midcentury geometric room divider by Adesso Imports. Custom sizing and pricing available upon request. 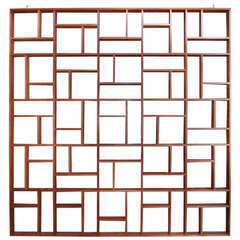 Vintage studio room divider. The geometric pattern has frosted glass inserts. The frosted glass panels are replaceable / interchangeable as show in pic. #3.